richard | Garand Webtech Inc.
Our client had a very common problem: they had set up all the right marketing tools, but they weren’t getting the orders they wanted. Their product has been sold through a small network of distributors for the last 15 years and they wanted to reach a much wider online audience. To do this they built a well-designed website, set up an e-commerce cart, and created a Google Adwords campaign. Everything was there — except the customers. The marketing campaign and the website just weren’t reaching the people who wanted to buy the product online. Normally when this happens it’s the result of a few different things that stop people from ordering. Imagine you have one problem that stops half the customers from ordering — you’ll lose 50% of your orders. Now imagine that you have three of those issues — you’ll be losing 88% of your potential customers! And many companies find themselves in an even worse situation. The good news is that when you start fixing those problems the orders grow quickly. To solve this we had to start by going back and seeing why the ads and the website weren’t connecting with the right audience. We uncovered what customers were really looking for, which led to a major change in the message used on the website and in the ads. This brought in 2.5 time as many customers. And we could see that they were a lot more excited about the product too from all the emails that we got. Next, we addressed the common fear the customers have when trying a new product by creating a special offer based on evidence that customers who tried it once were happy to order more. This more than doubled the number of new customers. Finally, with a stronger foundation in place, we started to optimize the Google Adwords campaign. With an ongoing process of minor changes, we were able to increase the number of customers brought in through the ads without having to spend more. The overall results during this time have been a massive increase in the number of customers. And this is just Phase 1 of the long-term strategy that we have mapped out. We are continuing to apply our marketing systems to build new opportunities. Want to see if we can do this for your business? Last week I showed some results from using a free software tool for marketing. Now if you haven’t done this before, you’re probably wondering “How can I make sure it’s done effectively?” or even “Is this something I should do?”. This isn’t easy to do well… after all the web is full of crappy software that no one wants. So what do you need to make sure you do it the right way and stand out? The great thing is that if you pull it off you will have a resource that people keep coming back to and sharing. Writing content will bring people to your site and they might even bookmark it and come back (but really, we’re all busy and rarely get time to return to our bookmarks). But when you create a useful tool people are much more likely to use it repeatedly and pass it around, getting constant reminders about what your business can do for them. 1) Understand what your customers need to do frequently. Preferably something that annoys them, or takes a lot of effort. You want a tool that they will really value and a simple way to determine that is if the lack of that tool causes pain. Nothing promotes your business better than something that they see and use regularly. If it’s a one-off tool you are much more likely to lose visitors unless you have extremely strong referral mechanisms built in (like a file sharing tool or anything else that involves sending something to other people). For example many companies that provide SEO software have free tools that have less functionality or only allows you to check a limited number of websites. People who are doing SEO need to use tools like this frequently so they will bookmark these pages and return often. Eventually some of these users upgrade to the paid version. 2) Figure out how to save them time in a mostly automated way. This means anything that can be done with a simple rule, or needs to be done many times without much variation. Anything that involves calculating results, looking up information, or formatting the final result can be a good candidate. This needs to be something that is really useful to your target market. A sign that you’re solving a real problem is that your target users are already doing something about it, they just aren’t doing it well. If you help people do something they have never done before they may not be interested. But if you help them do something that they already struggle to do every day they will be excited about that! One useful tool I saw was a free PDF invoice generator for freelancers. It automatically applied nice formatting to the information they entered. This was created to promote an online invoicing service so it was a natural next step to sign up for the paid service and get more features. Another idea could be to have a tool that will look up all the comments on a blog post and randomly pick a winner for a contest if you want to promote something related to social media. Even if your service is normally done manually, you might be able to automate the first few steps to create a promotional tool. And if this helps you save time when someone signs up as a customer too that’s even better! If you see something that your competitors sell as a paid tool, you might be able to offer it as a free tool to attract users and get more market share. 3) Check how it fits with your business. If your business is selling cakes and you build a tool that does backlink checks for SEO, it won’t help you much unless a bunch of hungry marketers use it! Now that doesn’t mean the tool needs to be a part of your main offering. In the case of the invoicing tools mentioned earlier, it was almost a “light” version of the main product. You could choose a different approach and create something that is separate from the product or service you sell, but still useful to your typical customer. This has the advantage that using the free tool doesn’t prevent them from buying your product. It’s not hard to come up with a lot of things that your customers need to do. This is a standard practice already for content marketing where you want to understand every topic that relates to the problems your customers face. If your product serves startup founders, something that helps them with hiring is always relevant and interesting to them. 4) Make it easy to get started. While your usual sales funnel includes critical steps such as getting someone’s email address or having them pay, those are barriers that make it harder to get started. For a free promotional tool it’s generally best to remove every barrier you can. Take steps out of the process and remove unnecessary delays so someone can get a useful result quickly and with minimal commitment. For example if you can display the result on the same page the visitor is more likely to see it. If you can show a result instantly without even requiring them to a click a button, they can hardly miss it. And someone who gets a good result from your tool is more likely to come back or to share it with others. 4.5) Make it easier to get started by pre-loading information. When someone arrives at a complicated web page with a bunch of empty form fields, it can be hard to motivate them to stay. Instead you can fill in sample information in the form fields and already have the results showing on the page. That way the visitor will get it immediately and be curious about what happens if they start to change the information. Curiosity is a powerful motivation and when it’s combined with a desirable result you will have a very sticky page. This is the approach I took for my experiment. As soon as you load the page you see an example of information you could put in and the results that information will give you. Change any number and the results instantly update! Unless you can read peoples’ minds it’s hard to get any easier than that. 5) Give them an incentive to upgrade. This doesn’t apply to all promotional tools. For example if you made a fun game set in a world related to your business, you probably don’t want to spend time selling a longer version of that same game. But if your tool is actually a feature from your full product you want customers to have a reason to upgrade. Here you need to start making things more difficult. The key is to make it easy to get started, but harder to do more advanced things. For example if your tool never saves the user’s information they might want to subscribe to a paid plan to save time when they return. Or if if produces something they send to other people, they might pay to have the software send it for them and even collect responses (for things like proposals or invoices). Where do you start? This is a lot to consider. Ideally you can analyze each step to come up with the perfect tool that your prospects will love. As a starting point it helps to think through the activities your customers do on a typical day and where you could automate something to save them time and remove pain. You might need to brainstorm this with your team and even talk to a few customers if you don’t already know from your market research. This should give you a short list of possible tools you could create. At this stage you may be able to guess that some are more difficult to build than others and narrow down the list a bit. Once you have this list you can start evaluating each option more closely. What will it take to build? Does it need to be updated after you create it? Does this solve an important problem that the customer thinks about all the time? Figure out the best tool you can create and get ready to leap past your competitors! What ideas can you come up with for a promotional software tool? When Should You Create A Free Software Tool To Promote Your Business? Neil Patel’s recent blog post shows how creating a free software tool can be more valuable than content marketing. He launched a free SEO analyzer that you can use to evaluate any website, and quickly got over 22,000 people using it with much higher site engagement than regular blog posts or even his in-depth guides that provide a lot of value. Even though he is an expert content marketer, this tool created better results than his regular content. Most marketers promote their business online using tools such as content marketing and infographics. Although those can stand out, everyone is doing it now (even infographics) so it’s harder to get noticed. If you want to really grab people’s attention it helps to create something that your audience has never seen before. Creating a free software tool or application is one way to do this. I recently created a similar tool and got high engagement as well. It actually wasn’t for any existing business. I just had an idea and wanted to measure the interest. This was a market where I had no existing following or audience. I had participated in a few blogs but never even bothered to attach my full name so I was starting from nothing. To test this idea I created a free tool for investors to rebalance their portfolio. Then I got a short profile in a national newspaper that included a link back to the tool. This led to 1,164 new visitors to the website over the following month and 1,493 pageviews. Normally if you get a piece of content featured in the media you’ll see a burst of traffic that dies off quickly. That happened here too. Within 4 days the traffic was back to very low levels. I had an email capture form at the bottom of the page that 1.5% of the visitors filled in. So far it sounds pretty typical… but what happened next was different. 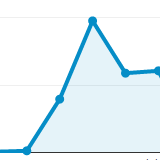 As I had hoped, visitors kept coming back to the website. Even though it hasn’t been updated apart from one small new feature and I haven’t done any more promotion other than a few blog comments, the site got 125 visitors in the last month. Of those, 52 visitors are new visitors from referrals, 47 are direct traffic (typed in, bookmarked, or clicked a link in an email), and the rest are search or social media. The direct traffic is the best indication of people who remembered the website and chose to go back to it without being prompted. It looks like anywhere from 4 – 10% of the original visitors from the media exposure come back every month. This tool is designed so any individual visitor should only need to use it once every 3 – 12 months so many of those people will wait more than a month before returning. Based on that I would estimate that it’s retaining 12 – 25% of the original visitors. Most of them aren’t on the mailing list yet but as long as they keep coming back to the website I have their attention. Since the website is very sticky, it’s also worth promoting it more to get additional traffic. All this comes from a simple tool that didn’t cost much to develop. All it took was my time, but you could hire a professional developer to build something similar for under $5,000. The cost will vary depending on the level of quality. For a promotional tool you want to make a really good impression. If your marketing doesn’t give you results like that, it may be time to consider different approaches to promote your business! Stay tuned… the next post will outline some important criteria if you’re deciding whether to promote your business with a free software tool. Our client is a social network site with a specific audience and message. Early versions of the site had shown success with an active audience in the 10s of thousands of users and major media mentions. However the interaction was too limited to continue the growth. The site was mostly just a large forum, and members were asking for a lot more. At that point development hit a roadblock. The forum had been relatively easy to build using existing software - taking nearly a year from start to finish. But the new needs included specialized ways of finding friends as well as things such as sharing journals and “thoughts of the day” to create interaction focused around the site’s message. The original developers hadn’t been able to move past the forum so new developers were brought in. However this turned into a long and expensive journey. In spite of an original 6-week deadline, the new project went on for nearly 9 months. The contract created major cost overruns and in the end the site was still unusable due to all the errors. The difficulty of getting these new features in place led to inactivity on the original site and members started to leave. When we came in the site needed to be revived quickly to take advantage of the initial interest. In October we reviewed the past versions of the site as well as the new demands from members, and suggested a package of features that would create a much better experience for members. In doing this we built on some ideas that would be important to the member experience while cutting back other requests that weren’t likely to make a difference. In November we started building the new site. With weekly reviews to present the new changes we had made and talk about feedback to guide the rest of the process, we quickly put all the functionality in place. During the process we created a unique and attractive design for the new structure. At the start of January the first users we able to enter the site and in February the site officially launched. The new version of the site led to additional international recognition for the business, participation in startup showcases and mentorship programs, and the discovery of a new and larger market related to the original one. This marked a rapid shift in the business – from a limited site that wasn’t able to add specialized features over a two-year period, to the quick launch of a full new site. Our development process took the client from long delays – where a project officially scheduled for 2 months could take over a year to complete – to rapid deployment where we incorporated new ideas along the way without going over the initial schedule. In the highly competitive world of online business, you don’t necessarily need to be the first to reach the goal line to win. But if you don’t move quickly you will be left behind. Only the right combination of skills, process, and focused effort will put you ahead and win you a bigger market share. Where could your business go with this kind of approach? Talk to us today to find out! Our client is an established market research company specializing in an industry that is slow to adopt change. They manage one of the leading annual surveys in the industry which created a steady base of revenue and visibility leading to other work. The revenue created by the survey was difficult to manage since it only happened once a year, and many customers skipped years because they didn’t see the value in frequent updates. With international expansion plans and new competitors, it was time to grow beyond the past successes and low profitability. Furthermore, the specialized needs of the survey required custom software that was nearly a decade old and starting to show serious limitations. The new opportunities came at a cost. There was better software that could be purchased. But even with six-figure annual licensing costs, it wouldn’t fully meet the needs. The process of creating reports for customers was time-consuming and expensive, and increasingly relied on benchmarks that were difficult to assemble. The competition wasn’t overwhelming yet, but it was starting to grow. Other market research companies were targeting the key market while software development companies with years of effort already behind them were producing polished research tools with development budgets in the millions. Our client had to find a way to defend their position with a smaller budget. We proceeded in two phases. First we built a fully interactive reporting dashboard to work with the existing survey data. This allowed customers to see automatically generated reports within days after their survey was completed, rather than waiting months for a labor-intensive analysis to be completed. It also allowed them to create their own reports using any of the survey data to answer internal questions about their market. This reporting dashboard changed the pricing structure to create more stable revenue. In the first year of operation it was very well-received by customers who saw it as a new and more direct way to get what they wanted. The first international customers also signed up once the dashboard was available. Following this, we continued to the next step in the progression. The survey system needed to be replaced to continue delivering better results. After reviewing the options we selected an open source system as a starting point to reduce development costs. We then heavily modified it to meet unique needs, develop a more modern interface (including full support for mobile surveys), and tie it into the reporting system with automated data processing. This new system allowed the continued evolution of the surveys to better meet current needs and start building new research models that would open up opportunities for additional partnerships and revenue. Following these steps, several further improvements were identified for the next stage. These include more reporting tools to allow valuable benchmarking that customers are asking for, as well as giving customers direct access to the survey system where they can create their own surveys or access and customize templates created by experts for specific needs. During the entire process we provided system support and maintenance to keep both the old and new systems operating smoothly, especially during peak times when a large part of their annual traffic happens within in a few weeks. In the end the combination of unique software, specialized experience in the market, and broad data for comparison created a new way to approach these customers and increase the revenue from the traditional offerings. The end result stands apart from competitors, who are all missing one or more of the critical components in this package. Where would your business go if it could break free from the past and find the opportunities waiting in the future? Contact us today to find out! Our client is a startup with a unique offering for students that relies on a complex series of interactions including assignments and video-conference meetings. The vision was to have all of this happen online, creating an innovative solution to a very old problem. The early attempts were a struggle as multiple experienced development teams weren’t able to complete a working version over an 18-month period. Instead the concept had to be proven by manually emailing spreadsheets and documents to complete assignments, and personally arranging phone calls between participants. Customers loved the results – but it needed to be automated so it could scale beyond the initial users. When we came in we saw that current state of the incomplete development gave us a starting point to help save time, but there were major areas that needed to be recreated. The development process had gone off track because it quickly became difficult to make changes and handle the complexity of the needs. Some parts worked, but every step toward the desired results would cause more new bugs and the system never fully worked. When we were approached in January we evaluated what needed to be changed and how the system could be fixed to do that. In some areas we recommended new ways of doing things to create a better customer experience and a simpler system. In others we discovered planned tasks that weren’t really needed. Simplifying a few non-essential areas cut the planned development time and cost for the initial version by 50-60%. We started the new development in March. The first version of the system launched in May and allowed a group of customers to go through the full 2-month program from end to end with an automated system that included special features such as built-in videoconferencing and webcam recordings. Their feedback was overwhelmingly positive and led to new ideas for improvement. A second round of development in July and August led to major improvements in key areas and the first version of a new, much more attractive look from a designer we created. The second group of customers started the program in September. Once again their feedback highlighted the many benefits of the system and a few areas that could be improved. With a third round of development in November and December we put in place those ideas as well as few internal ideas that hadn’t been a priority before. We also applied a more thorough design update and created a fully automated e-commerce system, with personalized pricing, that would allow customers to pay in a self-serve interface. The end result was a highly polished system that handled all the customer and management needs. This system launched to the first group of paying customers in January. As expected the feedback was positive and customers were very enthusiastic about the value they got from participating in the program through the online platform we had built. Following these results our client started another group of paying customers in June. At the same time the company was accepted into the Techstars accelerator – one of only 10 companies out of 300+ that applied – based on their proven results. They are now working on new ideas that build on the initial market to multiply their growth rate, and getting regular media recognition along the way. This progression highlights a very important insight for today’s online businesses. Trying to do everything at once can easily put your business in a dangerous position where you are rapidly falling behind your market. If you focus instead on the core of your idea, show that it works at a minimal cost, and then create incremental improvements from there you will be able to move much faster. This allows you to build momentum and capture the market before your competitors realize what’s happening. And just as importantly you will avoid months or years of wasted efforts as your early customers will tell you what you don’t need to waste your time on. In this project there were several major ideas we chose to wait for because they weren’t essential to the early versions. When we looked at how customers actually used the system we discovered that those ideas were not needed at all and avoided spending time on them. There is no development work more expensive than spending months implementing something that your business doesn’t need! Where can your business go with a focused process that quickly creates momentum and growth? Let’s talk to day and find out!